I take a highly personal approach to caring for my patients. Each patient is carefully evaluated and given a specific treatment plan for their individual needs. It is my goal to assist each patient in their return to an active and pain-free lifestyle as soon as possible. I accomplish this by using the latest proven operative Minimally Invasive techniques and non-operative treatments. 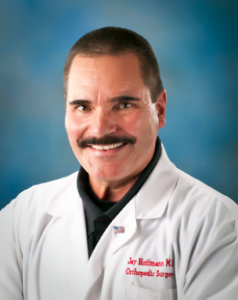 My patients are able to receive quality Orthopedic care close to home. Orthopedics is the medical specialty whose focus is to prevent or correct injuries and disorders of the musculoskeletal system. Musculoskeletal injuries can involve muscles, ligaments, bones, and joints of the body. Orthopedic surgery utilizes medical, physical and surgical means to restore the body to its optimum function. Hoffmann Orthopedics proudly serves Brazoria County and the surrounding counties. Arthroscopic Knee and Shoulder Surgery, ACL Reconstruction, Rotator Cuff Surgery, General Orthopedics, Including Joint Replacement, Ankle and Foot Surgery.